Wolf Cave is a crack in the Pyhävuori mountain in Kristinestad, near the Karijoki municipality in Finland. The upper part of the crack has been packed with soil, forming a cave. In 1996, some objects were found in the cave that brought about speculations that it could have been inhabited in the Paleolithic, between 120,000 and 130,000 years ago. These objects, if authentic, would be the only known Neanderthal artifacts in the Nordic countries. In 1996, plans were made to empty the cave of soil and turn it into a tourist attraction, but during the process, stone objects that might have been created by humans were found and the work to empty the cave was halted. 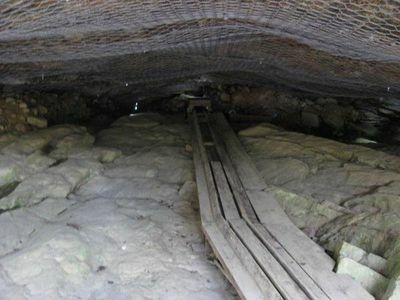 In 1997, an excavation of the cave was begun as a collaboration between the National Board of Antiquities, the Geological Survey of Finland, the Department of Geology of the University of Helsinki, and the Finnish Museum of Natural History. This excavation lasted until 2000, and was focused on determining the age of the materials, finding out if similar items could be found elsewhere in Europe, and reconstructing the prehistoric surroundings. The results were presented in a 2002 report.